Fertilizer | Soil Service, Inc.
As most all of us across the Midwest, I got out last Saturday morning to start digging out from the overnight snow storm. 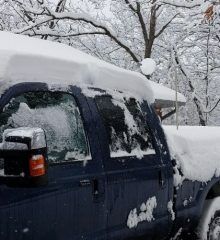 The picture of my truck was taken at about 10 a.m. Saturday morning and the depth of the snow on the tarp was at 8 inches. One hour later, after a lot of scooping and pushing snow, there was 9 inches. 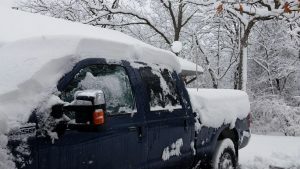 According to the National Weather Service at the Columbia, Missouri Regional Airport, this was the third highest snow storm since 1900, totaling 16.9 inches. While plowing out my driveway, I got to thinking about what the “Old Timers” use to say. “We’re getting a lot of free fertilizer from all this snow”. Some even thought it was a prudent thing to get out in the field and plow the snow under to capture that “free fertilizer”. They had observed that after a late winter or spring snow, that their grass and even their wheat crop greened up more than after a dry winter. So, the thought was that there was a lot of nitrogen in the snow. There is a lot of nitrogen in the air (78%), but snow is made of water. While some of the nitrogen in the air will attach to the water molecules, it’s not very much and most of that nitrogen, especially what’s in the top layer of snow, will evaporate and go back into the atmosphere. A small amount in the bottom layer of snow will go into the soil, but it such a small amount that, don’t count on it for part of your overall nitrogen program. Before the Clean Air Act took the sulfur out of auto and coal emissions that were going into the atmosphere, we did get a lot of our sulfur needs from rain and snow. But we no longer get that free fertilizer, and we must add that 15 to 20 units of sulfur regularly to our fertility programs for grass crops like corn and wheat. The biggest advantage of this blanket of heavy wet snow for most of us is the insulation of the wheat crop that is out there, protecting it from the artic temperatures which are forecast for this weekend and next week. We hope that you have not had any problems from this past snow storm, and you have had time to enjoy the beauty of what Mother Nature provided for us. Even though it was just a little pain in the you know what! 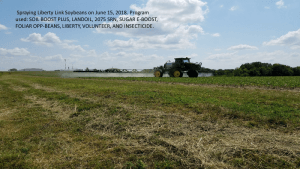 In an earlier posting, I showed a sprayer applying Liberty Herbicide to this field, using Soil Service, Inc. products with the Liberty Herbicide. 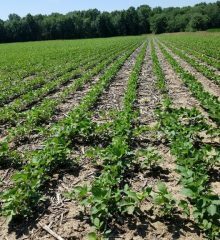 The pictures showed the coverage on the beans and on the weeds. Well, I got time to finally get back to that field, and as you can see, the weeds are gone and there is a very nice, CLEAN, field. 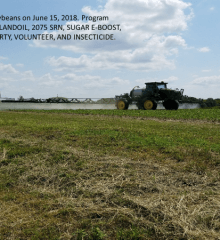 If you look back at the post from late June, we used SOIL BOOST PLUS, LANDOIL, 2075 SRN, SUGAR E-BOOST, AND FOLIAR OPP in the Liberty Herbicide mix, which also included an insecticide and Select. There was no crop response to this mix, only dead weeds and grass. 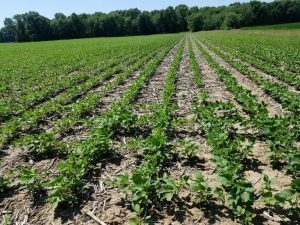 The beans at that time received a nutrient boost from the Foliar Opp and 2075 SRN. 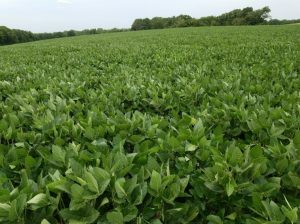 We really like this mix for Liberty Link Soybeans. Pods are just starting to set, and a good rain (in the forecast for the next couple of days) would be very, very beneficial. These pictures are from the same field, but it is split by a waterway. The field on left is to the north(with Crop Choice), field on the right is south of the waterway(without Crop Choice). 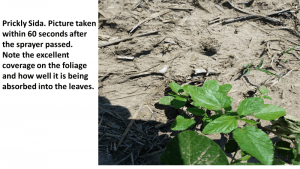 I have had several calls in the last week about yellow soybeans. All have come from an area here in the central part of the state that hasn’t had the rain. The farm in the pictures has just had about one-half inch, while just south of there had 3.5 inches. 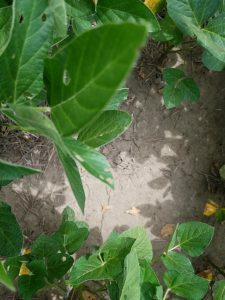 The beans in this situation are exhibiting potash deficiency, because with the extremely dry soil, the roots can’t get enough nutrients to supply the plants needs. 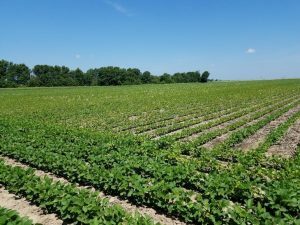 The producer is hoping for some rain which is in the forecast for July 1, and then we are going to foliar feed them with Foliar Opp. An interesting feature from the top photo are the turn rows. They look like they were planted before the rest of the field. They weren’t! The turn rows were planted several days earlier, and in tilled soil. 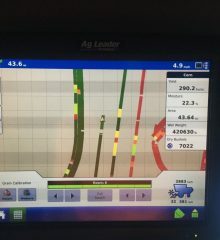 I asked the producer why they decided not to use starter on all the acres, and he replied they were trying to save money. 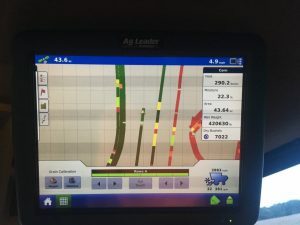 Wonder how much yield is going to be lost by not using Crop Choice Stater Fertilizer on all his acres? 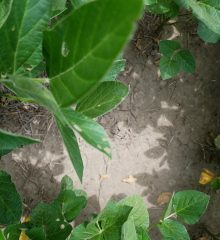 As seen in the pictures, we sprayed some Liberty Link Soybeans last Friday. I wanted to share these, because there was a 10 to 12 mph breeze (hot and very dry breeze here in Central Missouri). There was an excellent spray pattern and all the product was going where it was supposed to – on the target weeds. The FOLIAR OPP was going on the beans and being absorbed into them. Going back today to and expect to see dead and/or dying weeds! Wheat harvest has started in Central Mo, and we have a wheat plot with and without SUGAR E-BOOST. Check back for results.